This gallery depicts the madness, mayhem and sheer joy that ensued the Indian victory over Sri Lanka in the finals of the 2011 Cricket World Cup. 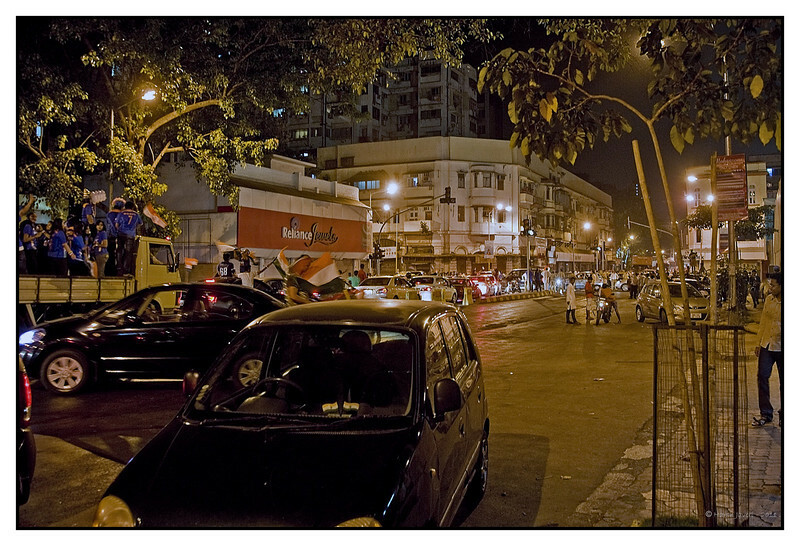 The people of Mumbai took to the streets in throngs celebrating this historic win till the wee hours of the morning. The trophy was brought home after 28 years in a tournament that India co-hosted along with Sri Lanka, and Bangladesh. The finals that took place between India and Sri Lanka at Wankhede Stadium, Mumbai saw a host nation lift the trophy at home for the first time. Fourteen national cricket teams competed in the tournament that spanned over forty days. When I reached home around1245 the family was sitting on the steps watching the celebrations and Jay was taking pictures but seeing me he handed the 'baton' over! The pictures are taken on our road except for #12 which is near Wilson College and shows Girgaum Chowpatty beach and the glow from Wankhade Satdium on extreme left.